This year’s graduation ceremony is finally here and I’ve waited a long time for this. This is the time when we all celebrate the culmination of the last four years and the beginning of our career in medicine. We recite the Hippocratic Oath (or at least the modern version that does not reference Apollo), and profess ourselves to do no harm. I am so happy for all of my friends and colleagues at AUC who have made it. This week, many I know have returned to the island where we started, to reunite with the friends we’ve shared this journey with and to don the cap and gown together, and seeing their pictures on Facebook has made me think a lot about my island home and my time there. Unfortunately I will not be making it to my own graduation ceremony, and I’m not gonna lie… a big part of me really want to go back, see old friends again, meet new ones, wander through campus, and see if things feel differently on the island now that I’d be returning without books. As much as I would have loved to go, I could not imagine celebrating without the two people that mean the most to me – my wife Irene and our new baby Lyra, my biggest supporters. It’s not the best time to travel for either one of them right now as Irene is still recovering and Lyra is only a month old. They are the two people who need me most right now at home and because of this, I will be celebrating here back in Georgia with them, my new family. Despite not seeing friends this time around at graduation, there will always be opportunities in the future, if we put some effort in making that happen. Later this month, my friend Patrick is going to be stopping by Georgia on his way up north to start his residency. We’ve known each other since college and I was thrilled to have gone to AUC with him and am so happy we both matched. At the end of this month, Arif and Chris are also going to be driving down to the deep south to come visit us for a few days and meet Lyra. These guys are the best and I am pretty excited. I know we will all have much different lives in the coming years, with different social circles and major life events, and we will change as individuals, diverging from what we have known of each other in our shared med school past. As the years go on, it is my hope that we still keep up with communication and not stop generating new conversations and shared memories, the stuff that bonds us together. Alright, enough filler content. Here’s the live streaming video of the 2014 commencement ceremony for all those who want to see! The ceremony will take place this Saturday, May 17, 2014, at 8:30am and 1:30pm Eastern Time (there are two ceremonies). If you can’t see the above video, please go to http://www.ustream.tv/channel/auc-2014-commencement-ceremony. I feel honored to have been one of the four recipients of the 2014 Award for Excellence in Community and University Services. With the drive for community service within the school and individuals dedicated to make a difference, there are lots more graduates from the AUC community who deserve this recognition. Although I was not able to make it to the island, I am touched that the school still included me in this special part of the ceremony. Thank you! AUC Commencement Ceremony 2010!! 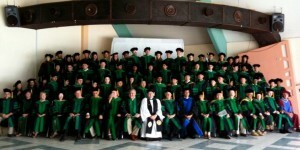 AUC 2012 Commencement Ceremony White Coat Ceremony Tonight! 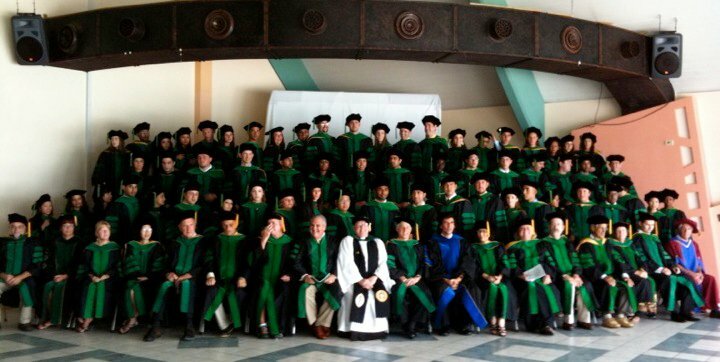 My Review of the White Coat Ceremony White Coat Ceremony, Webcasted Live! Thanks Fahd! Although I couldn’t be at my graduation ceremony, it was so nice to have been included in it, and I feel honored to receive the award. There are lots of people at AUC who have done great service to the community and truly many more people deserve such recognition. I am enjoying my time as a father while I still can (before residency starts). All the best to you. I am Dr Chumley’s husband. Also a family doctor and an academic at FIU COM in Miami. I have enjoyed reading your blog. Good luck at Mercer. Come down to visit us in Miami or SXM to let the AUC family know how you are doing. I don’t know if someone else is going to take over this important blog, but if you can talk some of your friends into continuing to write it would be a real service to the AUC students (and to other students thinking about med school). Thank you for reading my blog and for the good wishes! Although I haven’t met Dr. Chumley, I think AUC is very blessed to have her as Dean. I particularly find it great that she implements technology and social media to connect with the AUC community at large, like with her video messages and blog posts on the AUC website. I sure do hope I will again have the chance to come down to the island again to visit, see all the changes that has happened on campus since I left. I hope everyone at the Miami office is doing well. As for this blog, I will try my best to continue updating it as I go through my years in residency and beyond. I’ll do my best to update my existing posts so that the information will continue to be relevant. Hopefully other students may find the inspiration to add their own stories about their experiences at AUC and in med school via the blogosphere. Thanks again! First off, congratulations on not only your graduation and residency, but also the success you’ve had with this blog! It is an absolutely incredible thing that I feel fortunate to have stumbled upon. A few weeks ago, I was accepted to the American University of the Caribbean, and I can honestly say that your blog was one of the main reasons why I pursued this route to accomplish my dreams. If you would have told me a month and a half ago that I was going to be attending medical school on the island of St. Maarten, I would’ve responded with one of those ignorant answers most have about Caribbean medical schools. I did not get accepted to any US schools and was about to restart the entire exhausting application process, but strangely received a letter in the mail for another medical school in the Caribbean. I hadn’t even considered this to be a valid option – until I spent that night researching these schools. That’s when I fortunately came across your blog, and it opened my eyes to another path to attend medical school and pursue my dreams. I now could not be any happier about attending AUC in the fall, and I cannot thank you enough with all the help this blog has provided me. After all those rejections, it finally felt unbelievable to read a letter with the word “congratulations.” I just wanted to let you know that you greatly helped to open my eyes and see that all those preexisting notions that I had about offshore medical schools were absolute garbage. I feel fortunate to be in this position, and I cannot thank you enough. Good luck with your residency and everything else! Again, thanks for all the hard work that you have put into this blog – I am sure it has helped many others to pursue their dreams! Thank you so much for your kind message and congratulations on your acceptance to AUC! Med school was definitely a challenging, yet rewarding experience for me, and I am so thankful that AUC prepared me well to get to where I am today. As a premed student, I remember getting rejection letters one after another while some of my classmates who had similar scores and GPA were getting accepted to med schools in the US. When I finally received my first acceptance letter from AUC, I was so happy to be given a chance to pursue medicine, and I took that opportunity with all my heart. I don’t regret my decision one bit. I am where I want to be today. I hope you find success and inspiration in your journey as well. All the best to you! Quick question: based on reading your archived blogs, I see that you started in Sep 2009 correct? If that is the case, why was your graduation not until May 2014? I’m trying to better understand the timing of the semesters for basic sciences as well as for rotations. Most people who started September 2009 graduate May 2013. I took a few months extra, so I graduated October 2013. There’s only one ceremony per year held in May so people who graduated in the fall have their ceremony in May of the following year.